One thing I absolutely love about my job is being the first to see all of our new books! 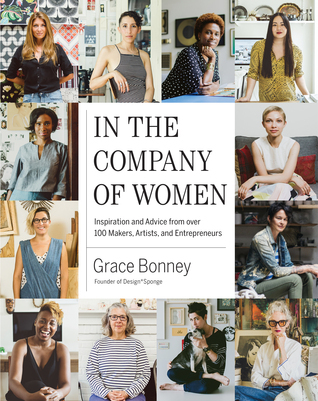 This gem, In the Company of Women: Inspiration and Advice from over 100 Makers, Artists, and Entrepreneurs by Grace Bonney, was one of the books I just had to take home and read instead of putting on the new books shelf. This is the type of book that you grab your cup of tea and a snack, cuddle up with your favorite blanket, and absorb all of the advice and information that these ladies dish out. This book is for all women everywhere. Issa Rae, Melissa Harris-Perry, Sheila Bridges, and many more inspirational women are interviewed. They give us advice on how to thrive in business (of any kind) while being our authentic selves. There are lots of frame-worthy quotes, one of which I posted on my Instagram. The pictures are bomb, too.